It was early morning when a Brahmin named Vishuddh RamPrasad Pandey was about to complete his morning ritual when he met three businessmen. They have introduced themselves as the dealers of Silk and Scent. They were on the business trip and have a remarkable stock of each of the item. They asked Vishuddh to suggest a place to stay. Greedy Vishuddh thought for his personal benefit and suggested a guest house. Vishuddh Pandey thought to kill those businessmen and grab all the valuables from them at first; but then he thought it would not be a wise decision. He need to sell the items later to convert them to money, which is not ideal. He thought it would be better to help them in selling the items and when they have the money, it can be captured. The businessmen (unaware of Pandey’s thoughts, obviously) thought about Vishuddh Pandey as honest and noble man, who is helping strangers. They talk of him highly. They then requested him to help them finding customers to sell goods to. Vishuddh assured to help. He then goes to meet Lala Jankidas and asked about how his business is going on and all. Then he suggested him to deal in scent and silk also in addition to silver (which was Jankidas’ main business) to earn fortune. Lala Jankidas agrees and then Vishuddh tell him that he know a few businessmen with such stuffs and can arrange a meeting with them. Lala Jankidas happily agree to pay him good commission on the same. The businessmen were talking highly about Pandey and have arranged all the goods they have in the display. Vishuddh and Jankidas comes there. Though the businessmen expected more customers but Lala Jankidas bought all the stuff (though it is not shown). The vendors now have the money with them. They were though in doubt that how to take all these money with them securely, as the decoits and other shady characters may know the stuff and loot them. Pandey affirms them about the risk and concrete their fear. Pandey then suggested them to convert their money into gems, this way the fortune will be small in the size, the businessmen liked the idea. The got converted their money into gems. They then asked Pandey for one more help. They asked them to arrange a surgeon for them. They wanted surgeon to operate them and hide the gems inside their body (which they can later get out via other operation at their place). Pandey meets a local surgeon and asked him the favor by paying remarkable fees. The surgeon does the needful. The next day when the vendors were on the way to their home, with Vishuddh Pandey, they were captured by a group of decoits. What happened then? Well, watch the episode to know that. The moral of the story is also revealed then. Just avoid the video quality and you will love watching it. 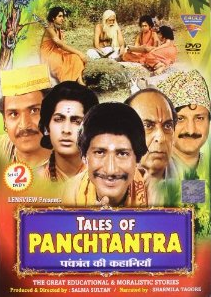 The convincing act by actor Rajendra Gupta and others are the positive factors. Keep reading, keep watching, keep getting wiser.